For me, Laredo, Texas is where my memories begin. I lived there for a year when I was four. A land of dust. Ants that bite with fire in their mouths. Heat and lizards and trailer parks. Empty swimming pools and a tiny church with cement block walls. Images of my childhood Texas are much like the memories I have of childhood dreams: stacked haphazardly in the attic of my mind, covered in a fine layer of time, in a spot where, no matter how hard I search, only the edges are visible. So when we left New Orleans last week and headed west towards Texas, I had certain expectations of what I would see. I think dust was the main one followed closely by heat, armadillos, and vultures. Yet the further west we drove in Louisiana, the more confused I became: the landscape was still green. Perhaps it will happen at the Texas border, I reasoned. Perhaps the sign “Welcome to Texas” will be a small part of a great line that stretches as far as I can see to the north and south, a line separating green Louisiana from a dusty brown Texas. But it didn’t happen. In fact, the deeper into Texas we drove, the more beautiful it became. Oaks and Mesquite covered the rolling landscape, growing alongside rocks and cacti. The trees were lower, like servants cowering from the sun, but there was something majestic in the harshness, something tantalizing in amongst the shade. 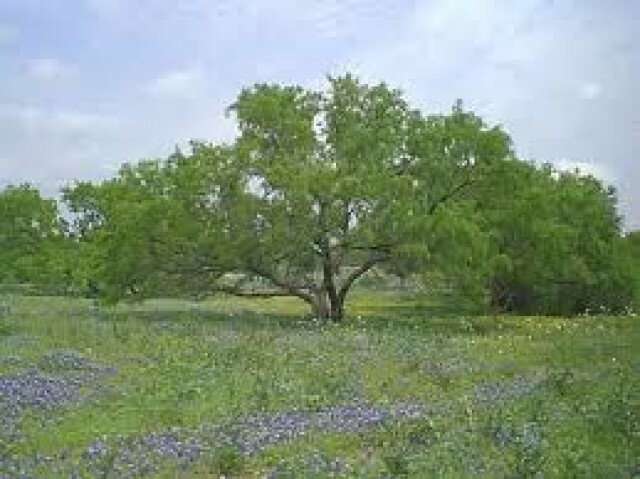 Mesquite trees thrive in Texas for a few interesting reasons: they have a tap root, some of which have been recorded at 190 feet under the ground; they can regrow even from six inches underground; even a piece of Mesquite root placed in the soil can regenerate. There is something to be said for deep roots. There is something to be said for pushing up from under the ground. There is something to be said for being broken and split and pulled up from the earth, yet maintaining a willingness to grow again. It was a pleasure meeting you, Mailey and the kids last night. Y’all are an inspiration. I always enjoy porch time with Maria. It was even better last night. Love your take on Texas. Benji, the pleasure was all ours. Thanks for hanging out, and thanks for the book. Next on my list. Can’t wait to hear about your trip to Brazil! The place where memories begin. That’s a great line! For me, it’s a day-care center in Benicia, California. I am pretty sure I was on a tricycle and drove over a garter snake. Nice. Sounds like a story. “The trees were lower, like servants cowering from the sun, but there was something majestic in the harshness, something tantalizing in amongst the shade.” That is just beautiful language and so captures the spirit in Texas-there IS something majestic in the harshness. Lovely post and as someone who has been pleasantly surprised by Texas, too, it was especially great to read. Thanks for a wonderful night of food and wine and discussion. Your kids were so overwhelmingly kind to our kids – much appreciated. Best night of my week. Sorry about the allergies! But thank you for sharing my your family with my little home, it was a treasure indeed. This is beautiful, sir. Roots are so important. Suppose you’re in the phase where you’re waiting to be replanted. My earliest memory stems from (what I believe was) a Montessori school: a woman in penguin clothes sat and played at a piano in a too-cold room (it was Pennsylania in the winter).